Started off our journey today after a big breakfast at hotel. Wanna visit GWK Cultural Park (Rp100000/ person) due to its cultural dance performance. The park is devoted to the Hindu God Vishnu, and his mount, Garuda, the mythical bird who become his companion and we could many of their images all over the park. We began our visit at Amphitheatre watching Balinese Dance- Barong, Kera, Rangda. There were musicians playing Balinese instruments as background music for the dance. Actually it was kind of like a story-telling drama show with different characters delivery mythological messages. It was quite enjoyable watching such a cultural performance there. However, we found ourselves a bit bored seeing scattered statues at the park later on as the park is is not completed. The ongoing construction of a gigantic statue of Wishnu riding on the back of a Garuda was told completion of the statue will be the end of 2016. From my point of view, some more attractions are needed to avoid the place feeling like an abandon or unfinished project. Bought some drinks and ice cream at the nearby supermarket. See how cheap the thing here are! Headed to Padang Padang Beach and we both found it very refreshing! Julia Roberts’s movie 'Eat, Pray, Love...' had two scenes filmed on it. The sandy beach with clear water and cute rocks all over were surely the reasons for crowds of tourists. Found the view even more breathtaking walking down the pathway on the right. Time for lunch and we chose to have it at Blue Point, the place with the most stunning white chapel facing spectacular view of the Indian Ocean. As too many people just went there for photos in the past, entrance fee (Rp100000/ person) is applied but the money paid can be claimed as a voucher in the restaurant there. Food there was just fair and we didn't have a pleasant lunch since there were too much flies in the restaurant. What we did was just finishing our food quickly and went photo shooting at the chapel. 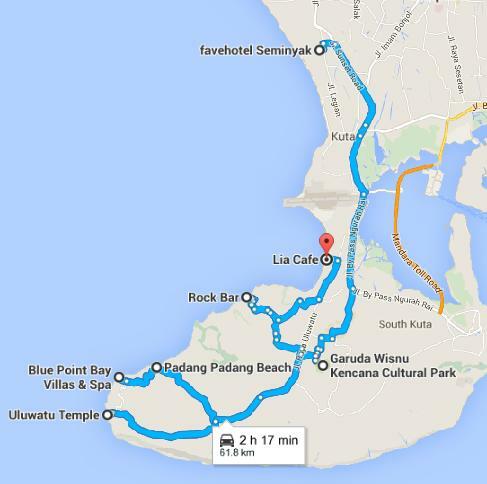 Initially wanna watch the sunset at Uluwatu Temple (Rp20000/ person), but we found a better option. Hence we decided to go earlier. Uluwatu Temple is a huge temple on cliff facing the endless ocean with great views for taking photos! We knew that the highlight is the show in the evening, where they enact the story from Ramayana. However, we didn't stay for the show but made our way to watch the sunset with nice drinks. The better option was Rock Bar at Ayana Resort. We queued for quite a long time as they have a fast track for residents there instead of outsider. It was like more then 30 minutes later that we were informed the queue was just for the cable down! Actually we could walk 10 minutes another way round to the reception and get a table right away! Fortunately we could still catch the last bit of sunset in the end while enjoying the drinks (Rp315000). A bit expensive but the chilling atmosphere made it worthy for the price. Our last destination of the day was about food. Dinner time at romantic Jimbaran! Lia Café was our pick provided that many bloggers recommended it online. We ordered package A and the price was lovely. We didn't expect very fresh seafood with this price but overall it was above standard for us. The portion was just right and we didn't feel hungry or had leftovers after all. Didn't have massage today as we were gonna pack our belongings, sleep early and move to another place the next day. Thanks for sharing! Hope you have a great time at Bali :-)! I did have a great time there! Your trip to Bali with your lovely family is awesome too! 你個honeymoon好正ar!我好鍾意睇你D blogs, 介紹D無咁熱門既地方!Work hard play hard,呢D先係人生!